Pierce Brendan Brosnan is an Irish actor, film producer and environmentalist. After leaving comprehensive school at 16, Brosnan began training in commercial illustration. He then went on to train at the Drama Centre in London for three years. Following a stage acting career he rose to popularity in the television series Remington Steele (1982–87). 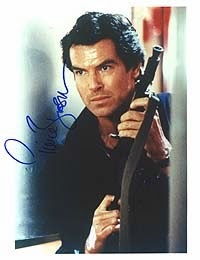 After Remington Steele, Brosnan appeared in films such as The Fourth Protocol and Mrs. Doubtfire. In 1995, he became the fifth actor to portray secret agent James Bond in the Eon Productions film series, starring in four films between 1995 and 2002. He also provided his voice and likeness to Bond in the 2004 video game James Bond 007: Everything or Nothing. Had been worked as a taxi driver, a fire-eater, and a worker who cleaned people's houses for Domestics Unlimited before his acting career took off. Has been both the lightest and heaviest actor who portrayed James Bond as he weighed 164 pounds during the filming of GoldenEye (1995), then increased to 211 pounds while making Die Another Day (2002). His favorite Bond movies are From Russia with Love (1963) and For Your Eyes Only (1981) while his least favorite one is On Her Majesty's Secret Service (1969). Brosnan first met James Bond films producer Albert R. Broccoli on the sets of For Your Eyes Only because his first wife, Cassandra Harris, was in the film. Broccoli said, "if he can act ... he's my guy" to inherit the role of Bond from Roger Moore. It was reported by both Entertainment Tonight and the National Enquirer, that Brosnan was going to inherit another role of Moore's, that of Simon Templar in The Saint. Brosnan denied the rumours in July 1993 but added, "it's still languishing there on someone's desk in Hollywood." In 1986, NBC cancelled Remington Steele and Brosnan was offered the role as James Bond, but the publicity revived Remington Steele. His contract with the Remington Steele producers required him to resume his role and he regretfully declined the Bond role. The producers instead hired Timothy Dalton for The Living Daylights (1987), and Licence to Kill (1989). Legal squabbles between the Bond producers and the studio over distribution rights resulted in the cancellation of a proposed third Dalton film in 1991 and put the Bond series on a hiatus for several years. After the legal issues had been resolved, Dalton decided not to return for a third film. On 7 June 1994, Brosnan was announced as the fifth actor to play Bond. Brosnan was signed for a three-film Bond deal with the option of a fourth. The first, 1995's GoldenEye, grossed US $350 million worldwide, the fourth highest worldwide gross of any film in 1995, making it the most successful Bond film since Moonraker, adjusted for inflation. It holds an 80% Rotten tomato rating, while Metacritic holds it at 65%. In the Chicago Sun-Times, Roger Ebert gave the film 3 stars out of 4, saying that Brosnan's Bond was "somehow more sensitive, more vulnerable, more psychologically complete" than the previous ones, also commenting on Bond's "loss of innocence" since previous films. James Berardinelli described Brosnan as "a decided improvement over his immediate predecessor" with a "flair for wit to go along with his natural charm", but added that "fully one-quarter of Goldeneye is momentum-killing padding." In 1996, Brosnan formed a film production company entitled "Irish DreamTime" along with producing partner and long time friend Beau St. Clair. Three years later the company's first studio project, The Thomas Crown Affair, was released and met both critical and box office success. Brosnan returned in 1997's Tomorrow Never Dies and 1999's The World Is Not Enough, which were also successful. In 2002, Brosnan appeared for his fourth time as Bond in Die Another Day, receiving mixed reviews but was a success at the box office. Brosnan himself subsequently criticised many aspects of his fourth Bond movie. During the promotion, he mentioned that he would like to continue his role as James Bond: "I'd like to do another, sure. Connery did six. Six would be a number, then never come back." Brosnan asked Eon Productions, when accepting the role, to be allowed to work on other projects between Bond films. The request was granted, and for every Bond film, Brosnan appeared in at least two other mainstream films, including several he produced, playing a wide range of roles, ranging from a scientist in Tim Burton's Mars Attacks!, to the title role in Grey Owl which documents the life of Englishman Archibald Stansfeld Belaney, one of Canada's first conservationists. Shortly after the release of Die Another Day, the media began questioning whether or not Brosnan would reprise the role for a fifth time. At that time, Brosnan was approaching his 50th birthday. Brosnan kept in mind that both fans and critics were very unhappy with Roger Moore playing the role until he was 58, but he was receiving popular support from both critics and the franchise fanbase for a fifth instalment. For this reason, he remained enthusiastic about reprising his role. In October 2004, Brosnan said he considered himself dismissed from the role. Although Brosnan had been rumoured frequently as still in the running to play 007, he had denied it several times, and in February 2005 he posted on his website that he was finished with the role. Daniel Craig took over the role on 14 October 2005. In an interview with The Globe and Mail, Brosnan was asked what he thought of Daniel Craig as the new James Bond. He replied, "I'm looking forward to it like we're all looking forward to it. Daniel Craig is a great actor and he's going to do a fantastic job". He reaffirmed this support in an interview to the International Herald Tribune, stating that "[Craig's] on his way to becoming a memorable Bond." During his tenure on the James Bond films, Brosnan also took part in James Bond video games. In 2002, Brosnan's likeness was used as the face of Bond in the James Bond video game Nightfire (voiced by Maxwell Caulfield). In 2004, Brosnan starred in the Bond game Everything or Nothing, contracting for his likeness to be used as well as doing the voice-work for the character. He also starred along with Jamie Lee Curtis and Geoffrey Rush in The Tailor of Panama in 2001, and lent his voice to The Simpsons episode "Treehouse of Horror XII", as a machine with Pierce Brosnan's voice.